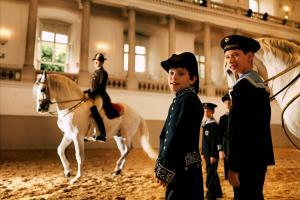 Two great events in one: the elegant horses of the Spanish Riding School, and the wonderful voices of one of the world’s most celebrated choirs, the Vienna Boys’ Choir. Enjoy equestrian performances of the Renaissance “Haute École” tradition, with the world’s only institution that has developed and perfected these for more than 440 years – the Spanish Riding School. The beautiful white Lipizzaner stallions will delight you with their incredible pirouettes and graceful movements. And these performances will alternate with those of the world-famous Vienna Boys’ Choir. This institution, founded more than 500 years ago by Maximilian I of Austria as the Children’s Choir of the Court Orchestra, will share some of its most sublime music, performed by the magical voices of its young members. This is an exceptional event, taking place in the Baroque surroundings of one of the most beautiful indoor riding halls in the world, the Winter Riding School of the Hofburg Palace (the latter being the old imperial residence of the Habsburgs). A special journey to the era of Maria Theresa.